You can use the New Dive Screen to quickly log a new dive while things are fresh in your mind. When you're back home you can even Merge the information with Downloaded Profiles. It provides a basic interface to log some of the more common things you may not want to forget, and even use an existing dive as a template to save you some time. Tap the More icon ( ) in the top right corner of any list of dives, and select New Dive. By selecting New Dive via the 3D Touch menu from the MacDive icon. It's easy! Fill out the information you want to record and then tap Create in the menu bar. You can add any Tags you'd like to a dive, however if you choose New Dive from within any existing Tag, then that Tag will be added by default for you. Any Gear that is set to automatically add to new dives by default, or any gear that is within a Gear Group that should add by default, will be included for you. You can modify this as you wish. You can choose an existing dive and copy the basic information from it. Tap the Template icon ( ) at the top right of the screen and you can pick any existing dive to base your new one on. You will see the old details added to the screen, and you can edit them further from there if you like. Most information is copied from the previous dive, however the date/time and notes are not. The site will only be copied if you have not already chosen one, and if no site matching a tracked location is found. More on that below. 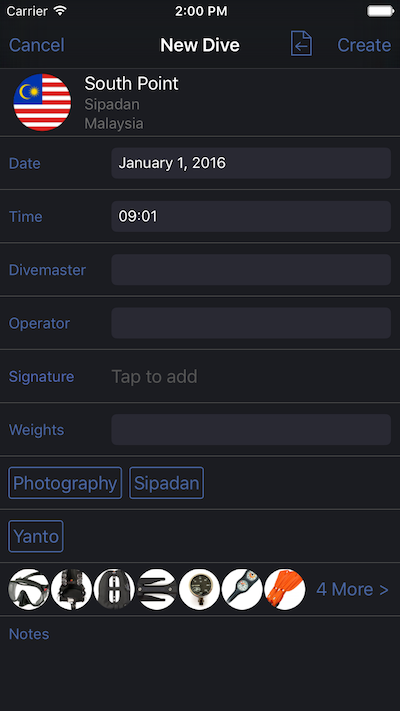 You can capture a Signature from your Buddy, Divemaster or Instructor by tapping as directed. A full-screen display will be shown, allowing a Signature to be drawn on-screen. If you create a dive from a template then the Signature will also be copied over. MacDive will try to help you figure out the Dive Site in various ways. As you adjust the date/time of the dive you want to create, the time will be checked against your previously tracked locations. If a match is found then you can create a site from that location. If you have an existing site logged near a tracked location, then it may even be suggested to you. If your current location is near an existing site then that may also be suggested. This is useful if you are logging a dive at the site. If no tracked locations are found then you can always pick or create a site, or use one from a previous dive. If you pick or create a site manually then location information will no longer be used (your choice will not be overridden).